Highly skilled energy professionals are the key to achieving clean energy goals. A clean energy future that integrates renewables, energy efficiency, and grid modernization is supported by government policy, private investment, and the public. As the energy industry grows, the workforce must grow also. But energy employers struggle to find workers with the skills and experience they require now and for the future. Employers’ capacity to provide education and training is limited, and other industry and labor market trends – such as predicted retirements – pose formidable staffing, economic, and energy security challenges. As members of the Evergreen Jobs Leadership Team, we advise the Governor and policy makers on federal investments in green economy and energy-related research, workforce education, and training. Washington State Legislature – Prepared analytical reports on green and clean energy economic development, innovation, and workforce education and training policy. Washington State Employment Security Department – Created the Washington state green economy jobs report. We also completed a green jobs report for the state of Pennsylvania, and see potential for similar work in other states. WSU Energy Systems Innovation Center – Conducted a labor market study of power engineering employment and workforce trends in the Pacific Northwest. Tacoma-Pierce County’s Workforce Development Council – Prepared sustainable economy and environment reports to support the promotion of a sustainable economy featuring energy-efficient projects and the use of local products and labor. Center for Advanced Manufacturing-Puget Sound and Center of Excellence for Aerospace and Advanced Materials Manufacturing – Focused on advanced manufacturing, sustainability, and workforce development. U.S. Department of Energy Smart Grid Workforce – Developed a career lattice for 10 energy craft and professional occupations; conducted a five-state labor market study of electric power employers; created skill standards for utility customer service representatives; reported on workforce implications of smart grid demonstration projects in the Pacific Northwest. Washington Workforce Training and Education Coordinating Board – Conducted industry research, and developed a job skills profile and policy recommendations for energy efficiency managers in manufacturing. Pacific Northwest Center of Excellence for Clean Energy at Centralia College – Our workforce team serves on the advisory board of this national Center of Excellence. National Science Foundation – Developed industry-defined job-skill profiles for two energy management occupations: Energy Conservation Program/Project Manager and Commercial Building Analyst. California Community Colleges Central Region Consortium – Created Skill Standards for Maintenance Mechanics for Food Manufacturing. Todd Currier assumed the role of Interim Director of the WSU Energy Program on January 1, 2019. Currier served as Assistant Director of the WSU Energy Program since 2002, and he has considerable experience with project and program leadership, strategic planning, and business development. The WSU Energy Program will benefit from his leadership skills and his regional and national reputation as he provides oversight, leadership and management of all functions of the organization. Currier has over 30 years of supervisory and management experience in energy efficiency program development, implementation, and evaluation. Currier has represented the WSU Energy Program in a variety of forums at the state, regional, national, and international levels. He has provided leadership to staff members engaged in building science research, building code development and implementation, indoor air quality improvement, workforce development issues and trends, resource conservation programs, industrial energy efficiency, renewable energy programs, and energy efficiency upgrades for homes and businesses. He currently serves as co-chair of the Industrial and Combined Heat and Power Work Group of the State Energy Efficiency Action Network, and is a member of the Pacific Northwest’s Regional Emerging Technologies Advisory Committee. He holds a Juris Doctor from the University of Puget Sound School of Law. Sheila Riggs is Assistant Director of the WSU Energy Program. She has served in this role since 2002. She has considerable communication, legislative, administrative, strategic planning, project management, and team development experience. Riggs serves as the liaison for the WSU Energy Program to the Washington State Legislature, University leadership, and in various other forums. She has provided leadership to staff members engaged in client software and web development, information systems, bioenergy programs, alternative fuels and electric vehicle programs, farm energy, communications, library services, internal operations and administration, facilities management, and human resources. Prior to her time with the organization, Riggs worked for the Washington State Department of Retirement Systems as the member communications and seminars manager and as the School Employees’ Retirement System communications manager. She was also a public information officer for the Washington State Department of Information Services. Prior to her state service, Riggs was a press secretary for a U.S. congressman and deputy press secretary for a U.S. senator in Washington, D.C. She also worked for the U.S. Department of State. Riggs holds two M.A. degrees – one from Washington State University in communications and the other from The George Washington University in international affairs. Tanya Beavers is an energy professional who works closely with the Building Science Division and is coordinating the annual Energy/Facilities Connections Conference hosted by the Plant Operations Support Consortium. She also provides executive support for other areas of the organization, writes communication material, and assists in coordinating building science trainings. Her professional background includes experience in marketing, financial services, and technical writing. She holds a B.A. in public relations with minors in business communication and Japanese from Central Washington University. Leslie Carman is an energy analyst with the WSU Energy Program, where she provides data management, manipulation, and visualization support. She also assists in analyzing, interpreting, and reporting data for research-based projects and energy efficiency programs; and provides friendly public outreach and assistance to clients and the public. Carman has several years of experience in data collection, verification, evaluation, and mapping of natural resources using GIS. She also brings a distinctive perspective to her work in natural resources preservation as the founder of an organic seed-saving operation and as an advocate of sustainable organic farming practices with the Sustainable Business Center, Knox College Farm, and Prairie Community Kitchen. She is completing her Master of Environmental Studies from The Evergreen State College and holds a B.A. in environmental studies with a minor in ethnobotany/horticulture sciences from Knox College, IL. Nels Christianson serves as a senior software engineer and has worked for the organization since 1996. Christianson has also been a computer analyst and programmer for the Washington State Energy Office, a self-employed computer analyst and programmer, a college instructor at Northern Marianas College, a regional engineer for Africare, Inc., and a service technician for S.C.A. Corporation. He served several times as a U.S. Peace Corps volunteer – as an instructor, a district engineer, and a computer system programmer. In 2006, Christianson served as an on-site engineer in Sri Lanka in rebuilding efforts after the devastating tsunami in Southeast Asia. He has two B.S. degrees, one in computer science/management from The Evergreen State College and one in civil engineering from the University of Washington. Jim Colombo has served as the Information Systems Department Manager and IT specialist for the WSU Energy Program and the Washington State Energy Office since 1987. Colombo has over 30 years of experience providing technical service, support, and training to citizens, management, and employees at state agencies and universities. Prior to his time with the WSU Energy Program, he worked for South Puget Sound Community College and the King County Library System. Donna Cowsert serves as our management analyst/fiscal officer. With 30 years of experience in the accounting field, she provides financial/grants management services, and reviews and submits proposals. Cowsert assists with subcontract setup, submitting match documentation, and resolving grant issues with the sponsor, principal investigator, and university. Her prior experience includes serving as accounts receivable manager, responsible for building and coaching a team to effectively implement grants, contracts, and interagency agreements. Alan Hardcastle is a Senior Research Associate at the WSU Energy Program. He has 30 years of experience providing leadership for quantitative and qualitative research and consulting projects with public/private-sector clients and stakeholders in industry, education, workforce and economic development. Hardcastle holds a Ph.D. in higher education and organizational change from the University of California, Los Angeles. He is an adjunct faculty member at The Evergreen State College, where he teaches a graduate course on clean energy. Karen Janowitz is a program coordinator at the WSU Energy Program. She has over 20 years of experience in project leadership and management; implementing, marketing, and managing energy efficiency and environmental programs; group facilitation; environmental education; communications; and administration. Janowitz holds a B.A. in geology from the University of Colorado and a Master of Environmental Studies from The Evergreen State College. Jim Jensen is our senior bioenergy and alternative fuels specialist. He conducts research and provides up-to-date information and technical assistance about bioenergy and alternative fuels and vehicles. Jensen supports federal and state agencies, local governments, and private clients. His current research activities include biogas/biomethane, biodiesel, electric vehicles, and green fleets. He serves on the state’s multi-agency bioenergy team, the anaerobic digestion task force, the Alt Fuel/Vehicle Technical Assistance Group, and the Western Washington Clean Cities Steering Committee. During 20+ years of work in the private and nonprofit sectors, Jensen has provided technical assistance to businesses in dozens of industries, assisted corporate social responsibility programs, and supported new green technologies and products. His technical knowledge and experience encompass research, development, and implementation of projects in the voluntary carbon market, renewable energy, recycling, waste prevention, anaerobic digestion, and composting. Jensen holds a B.A. from Grinnell College, Iowa. Gary Kaufman is a technical support specialist for the WSU Energy Program. 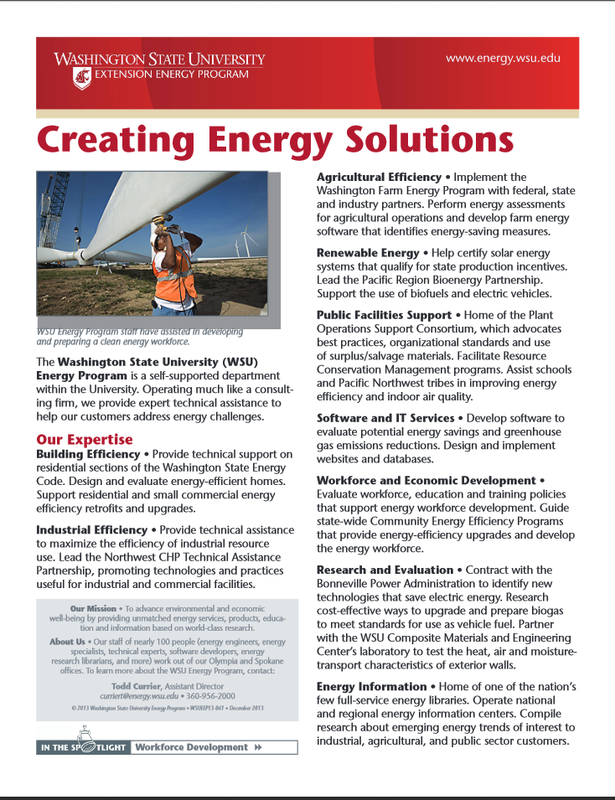 With over 30 years of cross-functional experience in business strategy, operations, and product and project management in the private and public sectors, Kaufman currently works with the U.S. Department of Energy Northwest Combined Heat and Power Technical Assistance Partnership, the Bioenergy Coordination Team, and other collaborative energy efficiency improvement efforts in the WSU Energy Program portfolio. He holds a B.A. from The Evergreen State College. Phil Lou is our solar energy specialist. He has over 20 years of experience in the building industry, culminating in designing and installing modern photovoltaic systems. Lou holds a B.S. from the University of Oregon and certifications in photovoltaic design and application, solar thermal design and application, and energy audit and weatherization. He developed curricula for and taught courses in the clean energy technologies program at a local community college. Michael Lubliner has worked in the energy conservation and renewable energy field for over 35 years, starting his career as the Pacific Northwest regional distributor for Grumman, Bio-Energy Systems and other renewable energy products. In 1983, Lubliner began working for the Washington State Energy Office, where he helped develop, implement, evaluate, and refine the Northwest Power Planning Council’s Model Conservation Standards, state energy codes, and Super Good Cents site-built and manufactured housing programs. He works in support of the U.S. DOE Building America Program and the U.S. EPA ENERGY STAR Program. Lubliner has a B.S. in energy engineering from The Evergreen State College. Gil McCoy, a registered Professional Engineer, is a senior energy systems engineer with the WSU Energy Program. He provides technical assistance and energy auditing services to industrial and public sector clients. McCoy’s areas of expertise include optimization of industrial systems (motor/drive, compressed air, steam, combined heat and power, and pumping). He served as lead engineer for development of software products including MotorMaster+ (motor energy management), International Motor Selection and Savings Analysis, AirMaster+ (compressed air system assessment), and BallastMaster (lighting system/ballast selection) software. McCoy is a U.S. DOE Qualified AIRMaster+ Specialist and a Qualified Steam Tools and Process Heating Specialist. He holds a B.S. in metallurgical engineering from the University of Washington and a M.S. in engineering from the University of California, Berkeley. Anneka McDonald is a performance and accountability specialist, leveraging skills in fiscal management, customer service, and database management. With training in various software applications and a focus on public agency issues, McDonald identifies and works to resolve accounting issues. Rob Penney, a registered Professional Engineer and Certified Energy Manager, is a senior energy engineer at the WSU Energy Program. He oversees a team of engineers and energy specialists to provide comprehensive technical responses, research, training, and publication development on a variety of building energy systems topics for the industrial, commercial, and institutional sectors. Penney also served as lead engineer for the organization’s Clearinghouse Services programs. Previously, Penney was the director of engineering services for Southface Energy Institute, where he managed projects such as energy auditing, building science research, and training. He was also a mechanical engineer for Rosser Fabrap International, where he performed HVAC, plumbing, and fire protection design calculation, layout, and specification writing for commercial and industrial facilities. Michael Pierson is an information technology support specialist. 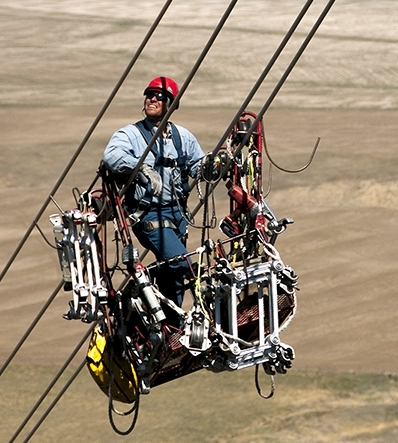 He is the primary contact for technical support for all outside client networks contracted by the WSU Energy Program. Pierson also supports the Energy Program’s day-to-day operations and works with the network administrator to upgrade network architecture and servers. Gerry Rasmussen has served as the graphic designer for the WSU Energy Program since 2004, where he has been instrumental in keeping the program’s publications and presentations looking consistent and professional. He holds a B.A. in fine arts/graphic design from Washington State University. Rasmussen worked for 33 years as a graphic designer in Washington state government, ending his tenure as the manager of the graphics unit at the Washington State Department of Transportation. Rasmussen continues to freelance – now for over 50 years – lending his graphic design expertise to clients in both government and private industry. Dr. Carolyn Roos is a mechanical engineer with over 25 years of experience improving energy efficiency in industrial and building systems, specializing in developing Excel-based applications for engineers and contractors. She provides technical assistance on commercial and industrial energy system efficiency and renewable energy projects. She also provides technical support to the U.S. DOE Northwest Combined Heat and Power Technical Assistance Partnership, focusing on CHP, biopower, and waste heat to power applications. Roos previously worked as an energy management engineer at Puget Sound Energy, where she performed energy efficiency analyses for commercial and industrial customers, and at the Army Corps of Engineers Hydroelectric Design Center. For her doctorate in systems science and mechanical engineering, she developed software to simulate simultaneous heat and moisture transfer in building environments. For her M.S. in mechanical engineering, Roos developed software to aid in the design of high-temperature solar concentrating furnaces. Vince Schueler is a program and system analyst with over 30 years of experience providing customer research, performance management, process improvement program evaluation, policy analysis, and strategic planning in state government and the private sector. He has a practical, result-oriented focus on energy efficiency and resource conservation. Schueler holds an M.B.A. in quantitative methods from the University of Washington and a B.A. in urban studies from the University of Maryland. He also earned a Lean Six Sigma Certificate of Achievement from Villanova University in 2008 and completed training at the Northwest Public Health Leadership Institute. As our communications specialist, Melinda Spencer has produced technical, educational, and promotional materials for all program areas. She is currently part of the Renewable Energy System Incentive Program management team, responsible for training our application review team, supporting the rulemaking process, and providing public outreach. Emphasizing plain language and user-centered design, Spencer has worked since 1984 as a university writing instructor, instructional designer, web content developer, textbook co-author, and community involvement specialist at Superfund sites. She holds an M.A. in technical and scientific communication from Miami University, Ohio; an M.Phil. in international peace studies from Trinity College, Dublin, Ireland; and a B.S. in biology/pre-med from the University of California, Davis. Mike Steele is an information technology specialist responsible for maintaining day-to-day operations of the computer network, assisting staff with technical issues, offering training on new technologies and tools, and serving as a primary network support for several of the WSU Energy Program’s outside clients. Steele has a B.S. in computer engineering technology from DeVry University. Lisa Terefenko is a software engineer with the WSU Energy Program. With a solid background in application/web development, management, and customer service, Terefenko plays a key role in launching and maintaining major websites and works with the WSU Energy Program’s industrial services team to develop and distribute the International Motors Selection and Savings Analysis software tool. As a private consultant, she worked with clients such as Microsoft, Chevron, and the University of Washington. Terefenko attended Pennsylvania State University and holds a B.S. in computer science from The Evergreen State College. David Van Holde, a registered Professional Engineer and Certified Energy Manager, is Director of the U.S. DOE’s Northwest Combined Heat and Power Technical Assistance Partnership and a Senior Energy Systems Engineer with the WSU Energy Program. David leverages more than 27 years’ experience working with utilities, government agencies, and consulting firms to implement innovative supply and demand-side energy solutions, and lead organizational change in support of advancing sustainable energy systems. His areas of expertise include combined heat and power and other distributed energy systems; government/utility energy policy, energy efficiency technology development, and utility program design. Before joining WSU, he served in leadership positions with Seattle City Light, King County Dept. of Natural Resources and Parks, E Source, EMI Consulting ,and SBW Consulting. In an earlier career, David was a mechanical CAD systems researcher for Tektronix and taught mechanical engineering courses at Oregon State University and Portland State University. David holds an M.S. in mechanical engineering from Oregon State University and a Bachelor of Engineering from Pratt Institute in Brooklyn, N.Y., both with concentration in Energy Systems. Anne Whitney is a librarian with over 30 years of experience in the library field, including positions as cataloger, indexer, library information specialist, head of a cataloging service, cataloging instructor, and art college librarian. Currently, Anne researches and writes materials for the Solar Plus program, produces the weekly Solar Newsbriefs publication, and applies her eye for detail to support the renewable energy incentive program. Whitney holds an M.A. in art history and an M.S. in information and library science from Case Western Reserve University. Laurie Wingate has been the information systems coordinator for the WSU Energy Program since 1997. She purchases and inventories computer hardware, software, and supplies for the organization, and provides technical support for office printers. "Each of us has a part to play in a new future that will benefit all of us. As we recover from this recession, the transition to clean energy has the potential to grow our economy and create millions of jobs – but only if we accelerate that transition. Only if we seize the moment. And only if we rally together and act as one nation – workers and entrepreneurs; scientists and citizens; the public and private sectors."